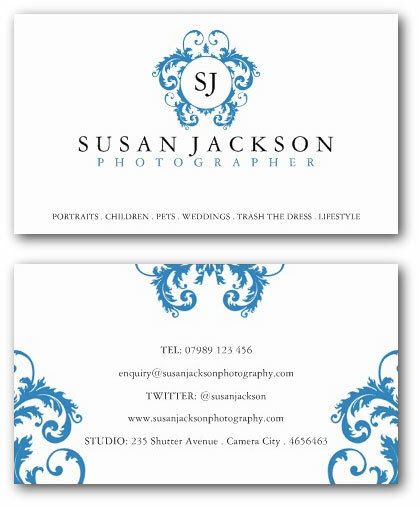 Ne14 Design has created the following stylish business cards for photographers. These customizable templates are available from our printing buddies at Zazzle. 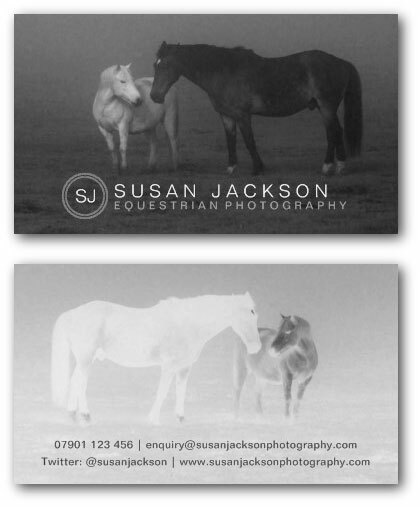 You can customize each card online, using your own contact details and using your own photographs, then place an order for however many you need printing. If you like one of these designs then just follow the link at the bottom of this page and start customizing. 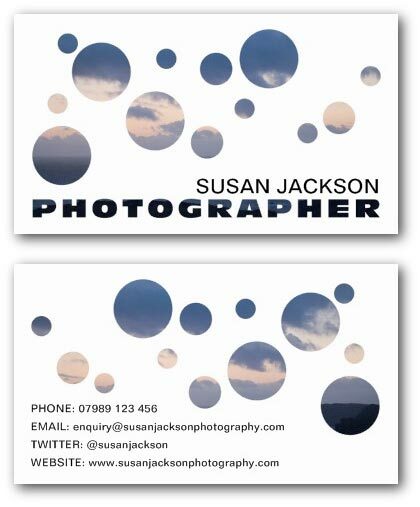 This photography business card design template uses a graphic that represents looking down a camera lens. On the front, you can customize the name, 'photography', and the list of services. 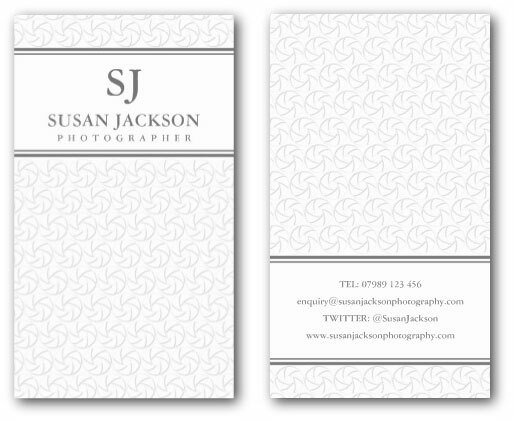 On the back, you can change the phone number, email address, website address, twitter profile name and studio address, if your photography business has premises, if not, you can leave some of these text lines blank or add other details, it is up to you. This elegant business card has a logo where you can add your own initials above your name. 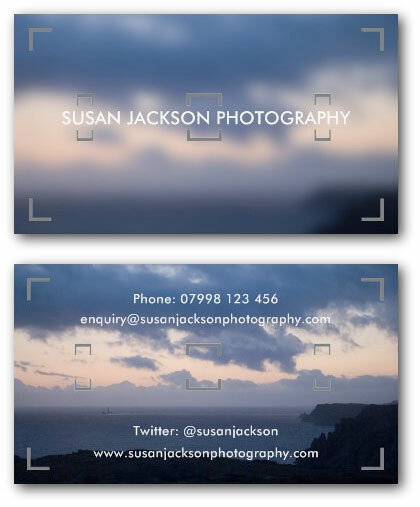 On the back, you can upload one of your own photographs to showcase. 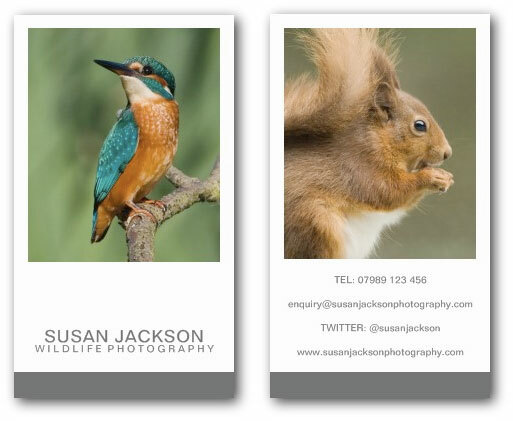 This example card, uses 'wildlife photography', but you can change this to any genre of photography. 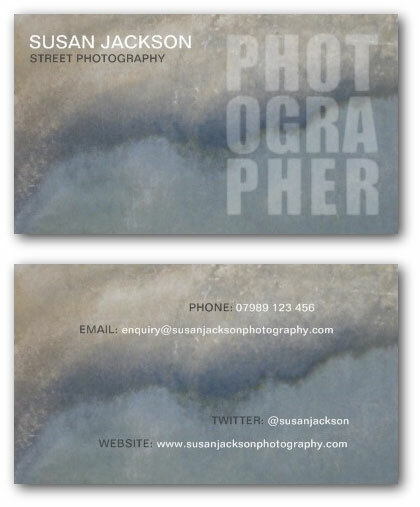 This business card template would work for an urban or street photographer. It has an image of a weathered wall on the front and back with space for your phone, email, twitter and website contact details. 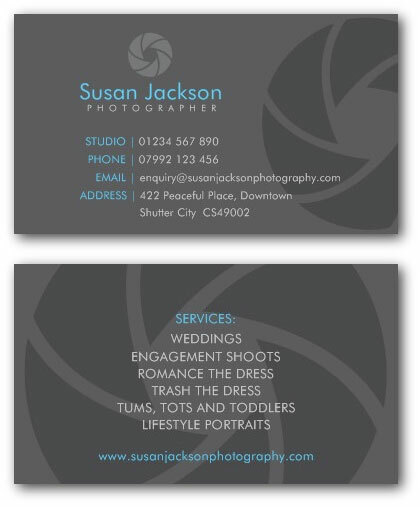 This photographer's business card uses a shutter symbol as a logo above the name. The logo is repeated on the back of the card with a list of services provided. 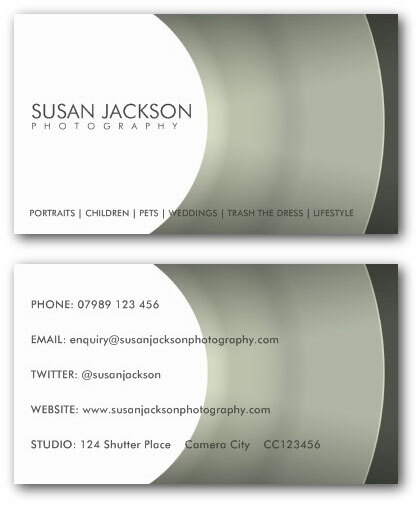 This template is meant for a photography business with studio premises, as there are lines for a separate studio telephone number and address. 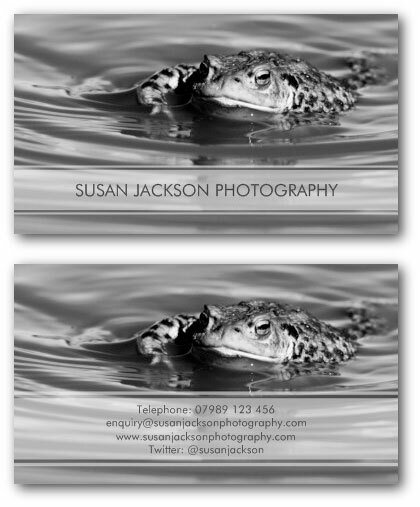 This vertical business card template allows you to upload two of your best photographs to showcase on the front and back of the card. This photo card uses the idea of a photo negative with an inversed image negative on the back of the card and an ordinary positive image on the front. If you would like to customize this template for one of your own photographs, then you will need to crop your image to 3.5 by 2 inches at 300 dpi resolution, then make a copy, select inverse in Photoshop or other editing software, and finally, flip the image horizontally. This card uses a simple illustration of a camera viewfinder creating a logo surrounding your name with an out-of-focus photograph in the background. On the back, the same photo is used except it is in-focus. If you would like to customize this template with one of your own images, then you will need to make a copy of the photo, and apply a gaussian blur filter to it in Photoshop. 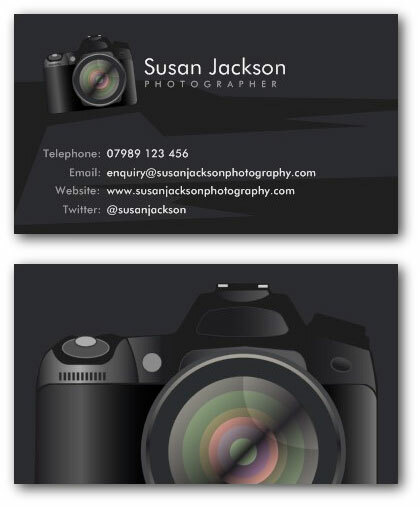 This photographer business card uses an illustration of a DSLR camera as a logo beside your name and also as the main image on the back of the card. This is a very elegant and stylish blue-on-white card with a crest logo where you can add your own initials. There is also a line on the front where you can list your business services. The back of the card has stylish leaf embellishments. This card is meant for a photography business that has premises, as there is a line for adding a studio address, but you could leave this line blank if you want to. 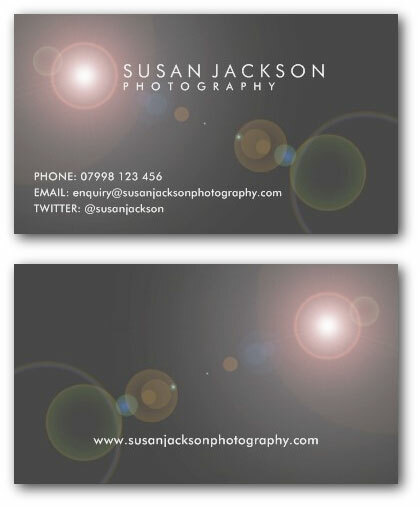 This design uses a lens flare image on the front and back of the card on a dark grey background. The brightest part of the flare creating a kind of logo beside your name. 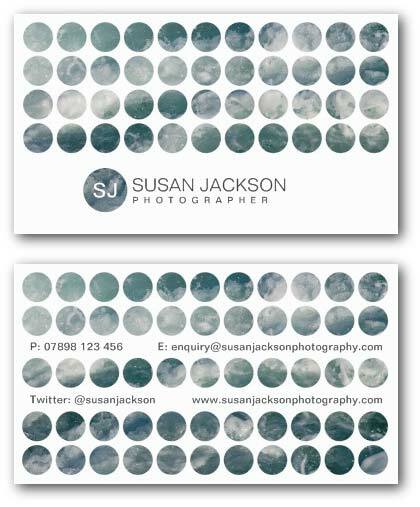 This vertical business card for photographers uses a very simple and stylish design with a white band across a shutter-patterned background and your initials creating a simple elegant logo. 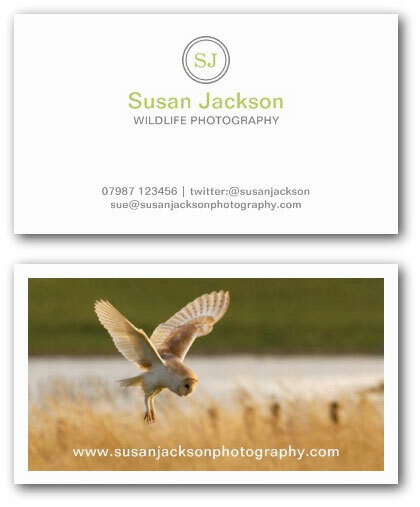 This card has lines for you to enter your phone, email, twitter and website contact details. This card has a random pattern of apertures cut out from white which will let parts of your own photograph to show through from underneath. If you use this template then it works best if you use an abstract photo or a landscape shot rather than a portrait for example. 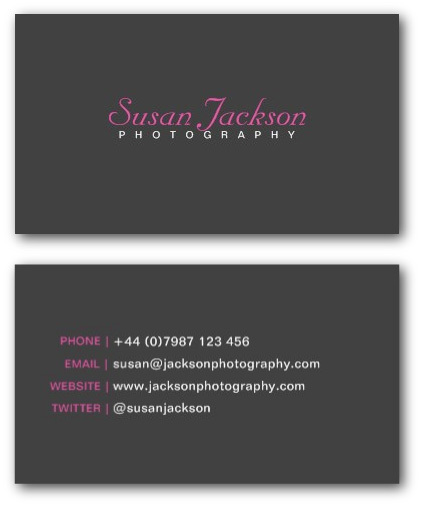 This is a very simple business card with a dark grey background and pink and white type. The front of the card has your name in an elegant script font and the back has just four lines for your basic contact details. This design uses a semi-transparent white band across an uploaded photograph. This allows some of the image underneath to show through while making the text on top clearly readable. This example uses the same image on the front and back, but you can use two of your own images here instead. This photographer business card has a mesh pattern with holes to let an image show through underneath. On the front, a larger aperture is used as a logo where you can put your own initials. You can upload two of the same photos for this template, or you can use two separate images here. This design works best when using photographs with an abstract image.